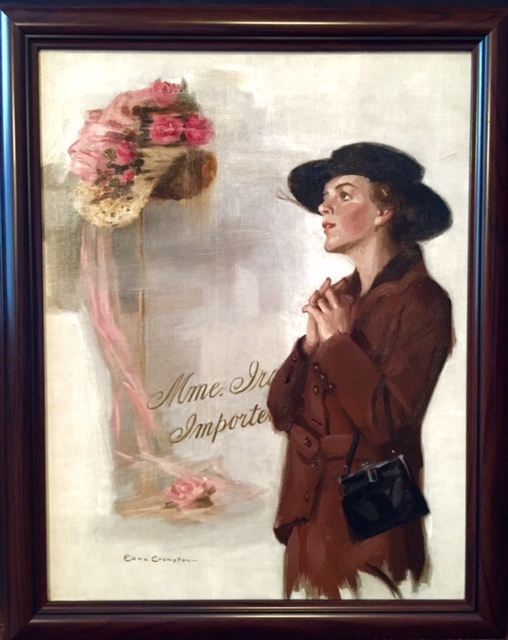 This oil on board painting was created by Edna Crompton for the March 31, 1917 issue of The Saturday Evening Post. This is a wonderful image of a young woman admiring a hat on display in a store, as she window shops. The expression on her face tells us that she is dreaming of herself someday wearing this very ornate hat, hoping to add it as an accessory to her wardrobe. According to US census records, Edna L. Crompton was born in 1883 in Kentucky. She studied at the Art Institute in Chicago, and lived in Oak Park, IL. She married Robert Warren Crompton, also an artist, around 1907. In addition to the March 31, 1917 Saturday Evening Post cover, Ms. Crompton created another image that appeared on the cover of the February 5, 1927 issue of the SATURDAY Evening Post, as well. She was the premier artist for Redbook, and created over twenty cover illustrations for that magazine. In addition the two Post covers and Redbook, she created covers for to Colliers, Pictorial Review, Judge, and Metropolitan magazines during this same time period. Edna Crompton passed away in1952.